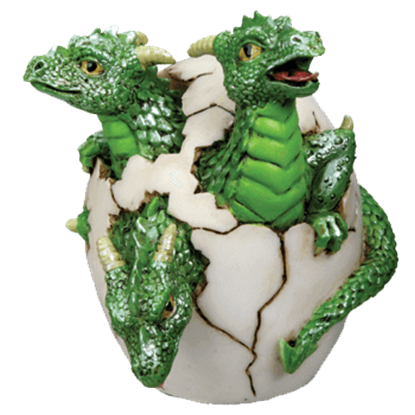 As monstrous as it might seem, this 2 Headed Dragon Hatchling Statue is actually cute, in a strange sort of way. Youthful and exuberant, this statue displays double the innocence that one would expect to find in a newly hatched dragon. 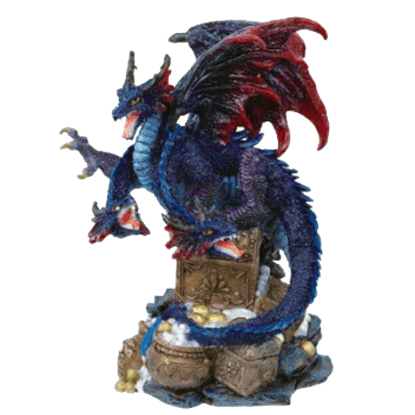 The 3 Headed Dragon Guarding Treasure Statue features a blue dragon with 3 heads perched on top of treasure chests. All dragon heads are in fighting stance, ready to protect their jewels. This statue is made of cold cast resin. It is difficult to tell whether this 3 Headed Dragon Hatchling Statue depicts a newborn dragon that has three heads or if it is an equally rare situation where the newborn dragonlings are triplets, all hatched from the same egg. 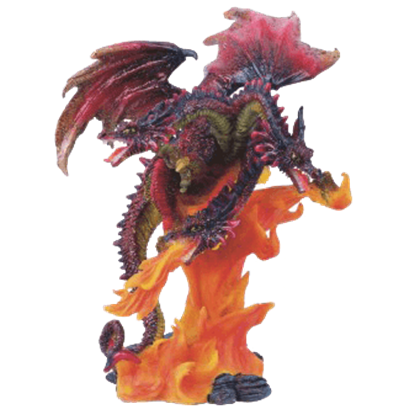 The 3 Headed Fire Dragon Statue features a multi-colored dragon with 3 heads perched on top of flames. All three dragon heads are in fighting stance, ready to protect themselves. This statue is made of hand-painted cold cast resin. 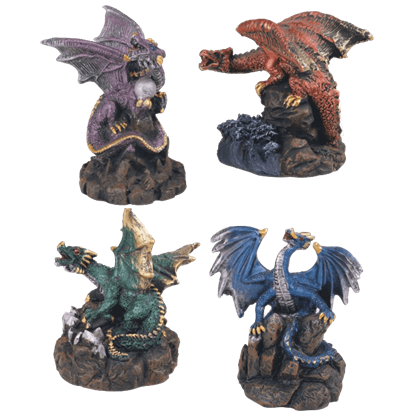 The 4 Piece Battle Dragons Set is the perfect set to display in your home or office. 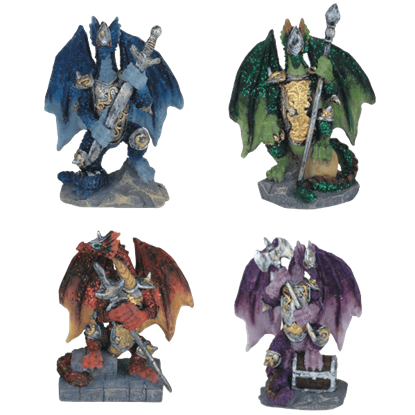 This great dragon set features blue, green, red, and purple dragons dressed in battle armour. Each dragon holds a weapon and stands on a stone base. 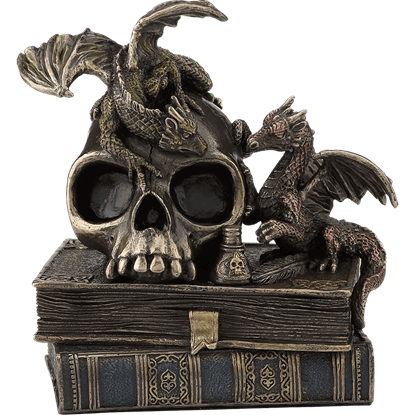 The 4 Piece Dragons Set is the perfect set to display anywhere in your home or office. This great dragon set features blue, green, red, and purple dragons in battle stance with teeth bared. Each dragon stands on a stone base. 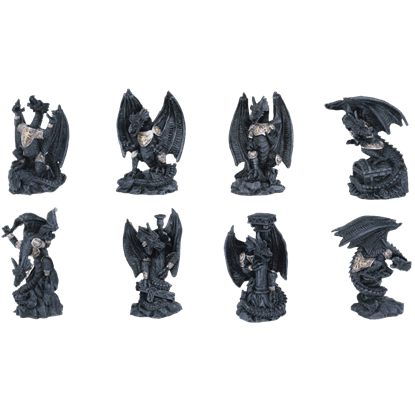 The 8 Piece Dragon Set is a great set to add to your collection! This set includes 8 dragons in 8 poses! Each dragon is dressed in silver and gold armour for battle, and they are perched on stone-like bases. They are hand-painted. The Abraxas dragon is made of hand painted cold cast resin. 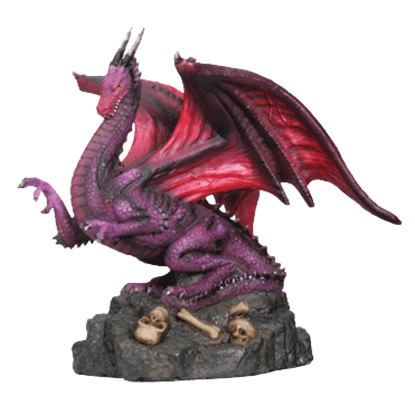 This statue features a purple, pink, and black dragon guarding his skeleton covered ground. The Abraxas dragon statue would make an excellent gift for any dragon collector! 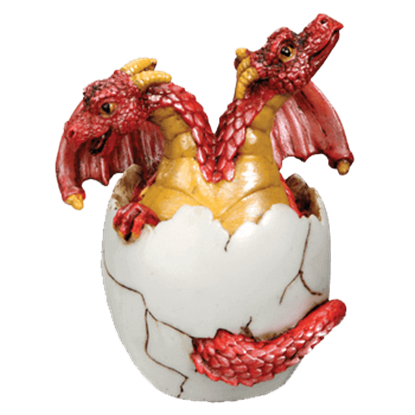 This young dragon hatchling has fallen in love with the first thing it set its eyes on upon emerging from its egg - you! 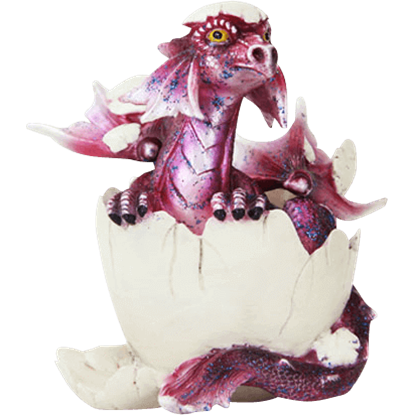 The Adoring Dragon Hatchling Statue displays a bright pink dragon still sitting in the remains of its egg. When a wizard departs on a magical errand late in the night, there is really nothing stopping his pets from lounging around on his skulls and spellbooks. The Alchemy Dragonlings Statue depicts one such scene of magical mayhem. 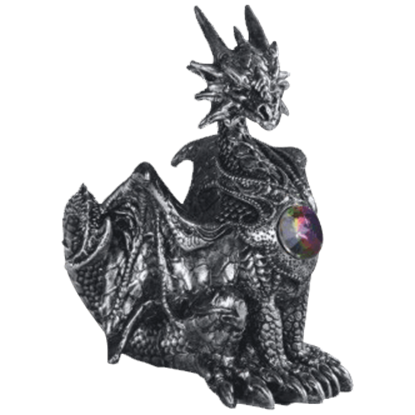 In an attentive pose, the dragon sits regally displaying the gem on its chest. The Alert Silvery Gem Dragon Statue depicts this fantasy creature in metallic, hand painted hues that highlight the details of its cast resin construction. There is no worse look a dragon can give you than the one this statue has. 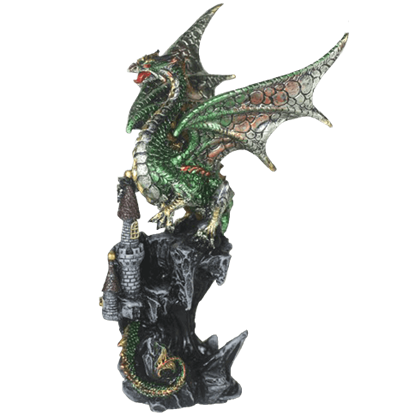 Our Angry Green Dragon on Castle Statue portrays a dragon rearing its head back as if ready to attack, perched atop a castle with its hand around the turret.